Given a random assortment of ingredients, can you create the best (or worst) dish to be awarded the coveted title of “Chef Cuckoo”? It’s a fact that anyone can learn how to cook. Given enough time, patience, and training, an individual can go from ruining a bowl of cereal to creating a 7 course meal that would make Wolfgang Puck sit up and take notice. But there is an elite group who are truly talented and can take anything you put in front of them to create edible miracles. And from this elite group, only a few are perceptive enough to “read” the individual they are cooking for and know exactly what ingredients would please the most. Are you one of these super chefs? Let’s find out! Chef Cuckoo!, by Blue Orange Games, is comprised of 60 Ingredient cards, 12 Food Challenge cards, and 36 plastic stars. Chef Cuckoo! is part of Blue Orange Games’ pocket line, which means the entire game fits in a small tin can. This makes the game highly portable and easy to bring with you to just about anywhere you would want to go and play games. To set up the game, select who will be the first judge and hand to this individual the square Food Challenge cards and the tin can that contains all the plastic stars. All the other players will be chefs. While the judge is looking through their cards, shuffle the Ingredient cards and deal 6 to each chef, face-down. The chefs are welcome to pick up their Ingredient cards but should not show them to their opponents. You are now ready to start cooking! The judge will select one Food Challenge card and place it in the middle of the playing area where all the chefs can see it. All the chefs now review and secretly select 3 Ingredient cards that will be used in the recipe to create whatever the judge selected. The goal is to provide the right three ingredients that will most please the judge. To help them with this selection, the players has several sources of information. First, the chefs know what their ingredients are by simply reading the ingredient title. Each Ingredient card also has an image of the food item (to help the chef determine the ingredients visual appeal), the amount of the food ingredient (t0 determine volume), and the number of calories the ingredient provides (to determine any specific health factors). All or only some of this information might be helpful or even relevant. Second, the chefs know what the goal is. The Food Challenge card will list one specific dish and use the adjectives “best” or “worst” to describe its level of quality. For example, “Best Sandwich” would require the chefs to select three Ingredient cards that could be used to make a very tasty lunchtime dish. Third, the chefs know the judge. Each chef must now carefully consider what would constitute the “best”or “worst” according to the judge. This can be highly speculative, but not to a point where the chefs are completely clueless. Based on the chef’s and judge’s cultural background, foods tried so far, and personal experience, the chefs should be able to make an informed decision on what ingredients to use. Using all three sources of information, each chef now selects 3 Ingredient cards and places them face-down in front of them. Once all three chefs have completed their ingredient selection, the judge closes their eyes or turns away while another chef quietly and quickly randomly arranges the stacks of ingredients in front of the judge. The judge now flips one stack of Ingredient cards over at a time and talks through their thought process used to determine if the 3 ingredients fit the Food Challenge card’s description. This can be a lot of fun and the judge should be as flamboyant as they like, but at no time should the judge ask which chef provided the stack in question, nor should any of the chefs make any indication to suggest which chef owns them. The judge will reveal and discuss each stack of Ingredient cards until they are all shown. Once they are all reviewed, the judge now takes the tin can full of plastic stars and places 2 plastic stars on the stack of Ingredient cards that best correspond to the food challenge and the judge’s personal taste. One plastic star is awarded to the runner-up. The chefs now reveal who provided what ingredients and collect their plastic stars if they were awarded any. Chefs are welcome to defend their culinary choices, but the judge’s decision is final. If the endgame condition is not yet met, the tin can full of plastic stars is now passed to the next player going clock-wise, who is now the new judge. The Food Challenge cards are gathered and given to the new judge who also collects all the Ingredient cards, shuffles them, and deals 6 cards out to the chefs for another round of competitive cooking. Any plastic stars the chefs’ have won so far are kept out in front of them and visible at all times. The game can end one of two ways. The players decide which one of the following two conditions determines if the endgame has been triggered. Once there is a winner, they are presented with the title “Chef Cuckoo!” and all bow before the winner’s culinary greatness! Edible Arguments: the chefs are given a chance to acknowledge their ingredient choices and defend them, making their case before the judge, explaining why they should be awarded the most stars. Presentation Pomp: instead of the judge revealing each stack of Ingredient cards, the chefs keep their selection in front of them. Chefs now take turns revealing their 3 ingredients, give each dish they created a name, and a description. To learn more about Chef Cuckoo!, see the game’s web page. Games where the players attempt to guess what another player is thinking provides for a fun game of social interaction and much conversational debate. These games also tend to be very casual and light. Chef Cuckoo! is no exception. Based on the game’s rules, I believing this is a game that my 5-year-old could play even though there is text to be read. Certainly helpful, but not required reading. The images on the Ingredient cards should be enough for him to identify what the food item is, and if he needs help, showing one of the ingredients to a fellow chef won’t unbalance the game. What is necessary to play is logical and critical decision making and a healthy imagination. If a player must be able to “read” anything, it is the judge. What constitutes as “best” or “worst” is highly subjective. Each chef must speculate, using what they know of the judge’s personal tastes, what 3 ingredients will win the judge’s heart of turn their stomach. This is where the real challenge of the game lies. Teaching the game takes all of a minute and a quick demonstration of how each chef will select their 3 ingredients is a good idea. By demonstrating, none of the chefs will feel overwhelmed on their first round of play when given 6 Ingredient cards of their own to manage. For our groups, everyone was feeling good about what they needed to do and excited to play after no more than 2 minutes worth of game explanation and demonstration. 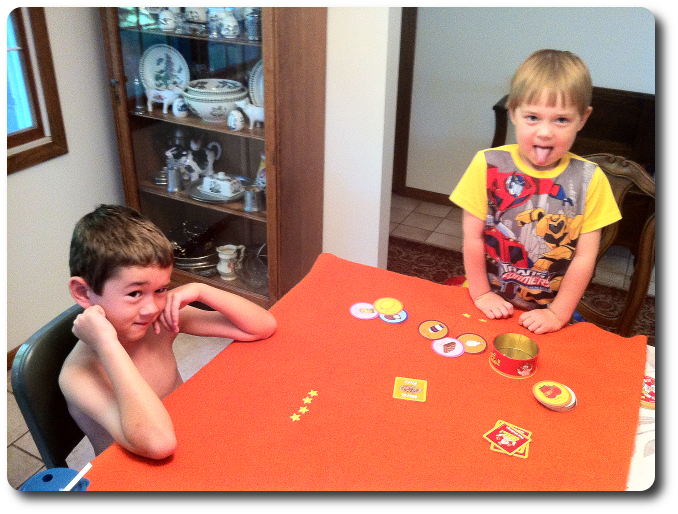 As I set up the game to play with my little geeks, I asked them their thoughts on the game so far. The mood at the table is positive and the players are enthusiastic. Let’s see if this game cooks up some fun or boils over in ruin. First of all, my oldest son’s observations on the similarities to Apples to Apples is spot on. In fact, Karl (a Father Geek staff member) said it sounded like Apples to Apples just from a very brief description I gave him. Chef Cuckoo! works in the exact same way, but with fewer cards, less required reading and vocabulary (making it easier for little geeks to play), and with a bit more theme. If you are not a fan of Apples to Apples, odds are you will find the similar game mechanisms and play found in Chef Cuckoo! a bit souring. My little geeks loved Chef Cuckoo!, finding the game to be fast and funny, with just enough challenge to keep them engaged but never enough to make them feel stressed. My 5-year-old did brilliantly and only asked for help with an ingredient once (he didn’t know what prosciutto was). My 7-year-old was able to read all the information on the Ingredient cards without issue and never asked for help. Both of the little geek chefs did an outstanding job and kept the game competitive and lively. 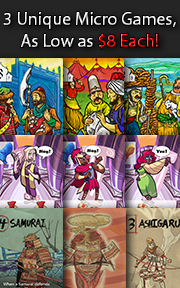 We played using the game variant where each chef revealed their meal, which gave each player an opportunity to take center stage and ham it up (if you’ll excuse the meaty pun). Parent Geeks also had a wonderful time and the game served up a lot of laughter. With the Parent Geeks, we played with both game variants and the table talk and arguments were spicy and rich which actually resulted in a few judgement reversals. Non-gamers also had a wonderful time and were ready to play the game again once it was over, demanding seconds. Players who also enjoyed cooking shows, like Iron Chef and Chopped, loved the game’s theme and wouldn’t stop talking about their favorite cooking show moments even when we tried to change the subject. 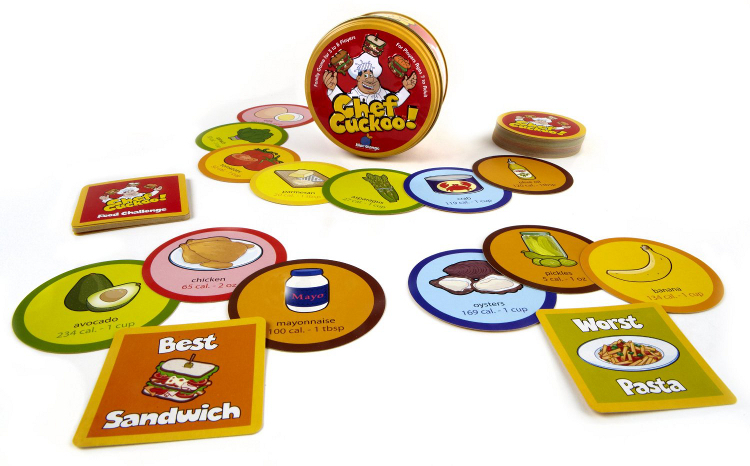 Of course, all Parent Geeks who enjoyed Apples to Apples loved Chef Cuckoo!, which should come as no surprise. Gamer Geeks agreed the game was fun, but would only sit down for a game if they had to play it with non-gamers or their kids. They suggested that Chef Cuckoo! would require the right group (where “right” means funny and sarcastic) to make the game entertaining. In other words, it did little to please their palate or satisfy their hunger. Gamer Geeks, this is an exceedingly light game of guess-work and some culinary debate. It’s Apples to Apples, but with food. While the game is exceedingly well done and fast, it will not serve to satisfy your unquenchable hunger for complex and engrossing games. If, however, you must serve up a tasty game meal at your table with friends and family, this will certainly be a hit. But with your elite gaming group, we think not. Parent Geeks, this is an excellent party and family game. Lots of fun thinking to be had and a wonderful opportunity for you to become the chef you’ve always wanted to be (or can never be). The game is easy to teach and easy to play, with the challenge and fun focused on guessing what each judge will or will not turn their nose up to. Sometimes the players will want to create cooking delights and sometimes horrendous plates of goop. It all depends on the Food Challenge card. Enjoy this game of guessing and then defending your excellent or very poor choices of freshly cooked meals. Child Geeks, here is a game that you can play and compete at the table in equal standing with the most elite of Parent and Gamer Geeks. 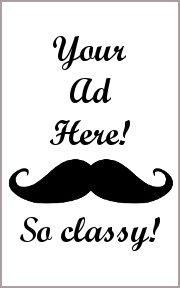 This is a game of personal taste and knowing the judge. You know what tastes good or what would taste bad, but do you know what the judge thinks? Certainly there is some common sense to be used here as no one would really want to eat a tuna banana burger, but that might be exactly what you need to create, too! This game will keep you thinking and using your imagination to come up with the best or worst dish possible. Have fun and be creative in your table top kitchen! I rather liked this game and found it to be an excellent time with my family and friends, not to mention an outstanding alternative to Apples to Apples (of which I am most sick of). Not a good game for the Gamer Geeks, but that’s not really a problem. I have more games than I know what to do with to play with my elite gaming buddies. What I am lacking are engaging casual games I can play with a mixed group that have different levels of experience and personal taste. Chef Cuckoo! is a game that can be played with little geeks and the most venerable of geeks to be had, with people from different cultures, tastes, and levels of cooking experience. In fact, the only requirement to play this game is the time needed to enjoy it. What pleased me most about Chef Cuckoo! was the Ingredient cards and how they could be used in multiple ways to tempt the judge for plastic stars. For example, if I knew the judge was health conscious, I would select vegetables and ingredients that had reasonable portions and low calories. If I knew the judge was meat lover, I would load my dish with tasty meats and sauces. If I knew the judge enjoyed presentation and looks, I would select Ingredient cards that had complimenting colors. There was always enough for me to use and to think about to provide a creative dish that corresponded to the judge’s Food Challenge. I didn’t always win, but I always felt satisfied with my choices and the game play. Although, in truth, I think some of the judges were total food fools. I clearly had the worst pizza when I presented a dish comprised of mozzarella, snails, and oysters. 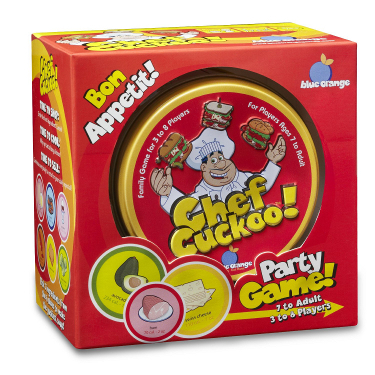 Do make room at your gaming table for Chef Cuckoo! if you are in the mood for a light game of tasty guess-work, imagination, and decision making full of stomach turning and mouth-watering results.